The first road-going "Pininfarina Sergio" a striking coachbuilding collaboration between Pininfarina and Ferrari to honour the life of Sergio Pininfarina of which just six examples, based on the Ferrari 458 Speciale, were created, is coming up for auction this weekend at RM Sotheby's prestigious Monaco sale. The first road-going "Pininfarina Sergio", a striking coachbuilding collaboration between Pininfarina and Ferrari to honour the life of Sergio Pininfarina of which just six examples, based on the Ferrari 458 Speciale, were created, is coming up for auction this weekend at RM Sotheby's prestigious Monaco sale. Within the scope of automotive history, coachbuilding is considered by many to be a lost art, one confined to the early days of the automobile and the immediate post-war years, where well-heeled owners could buy a chassis and drivetrain from a given manufacturer and commission a coachbuilder to build a body to their own individual tastes and uses. Images of Delahayes with Figoni et Falaschi ‘Teardrop’ coupé bodywork or the jet-age Fiat 8V Supersonics by Ghia come to mind, recalling an age where cars could quite literally be rolling sculpture. As time marched on, coachbuilding faded into oblivion due to ever-rising costs and stringent governmental regulations, leaving such cars out of the question to all but the Sultan of Brunei. 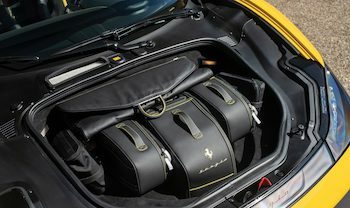 A handful of manufacturers and companies, however, have made an effort to bring the lost art of coachbuilding back to its glory days over the course of the last 15 years, and leading the charge is Pininfarina. Starting with the Ferrari P4/5 by Pininfarina and the 612 Kappa, based on Ferrari’s Enzo and the 612 Scaglietti, respectively, with both cars commissioned by for well-heeled American collectors, Pininfarina led by example and others quickly followed. Cars with mass-produced chassis and drivetrain clothed in Bertone, Zagato and Touring Superleggera coachwork in addition to Pininfarina stunned the public and proved that with proper effort from both a design and engineering standpoint, coachbuilding in the 21st century was possible. 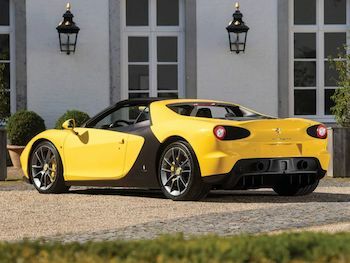 Ferrari was the first manufacturer to bring this formally in-house with their Special Projects division, quickly taking note of the developing trend and bringing the entire process in-house in an effort to manage their clients and their cars from start to finish. Built to honour Sergio Pininfarina after his passing in 2012, the Pininfarina Sergio concept first broke cover at the Geneva Motor Show in 2013. 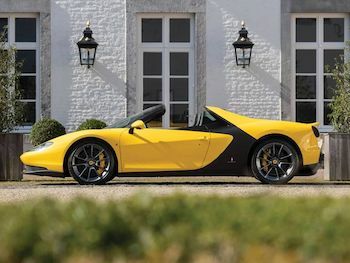 A two-seater Barchetta that was distinctly recognisable as a Ferrari but discernibly unique and forward thinking, the Sergio stunned those who attended the show and proved that Pininfarina was still capable of greatness. Although it was not intended for production at the time, the concept was underpinned by a Ferrari 458 Spider chassis and drivetrain, helping to bridge the gap between concept and production, this proving that for the privileged few, this spectacular car could come to life. Several months later, that dream was turned into reality for a handful of lucky Ferrari clients. 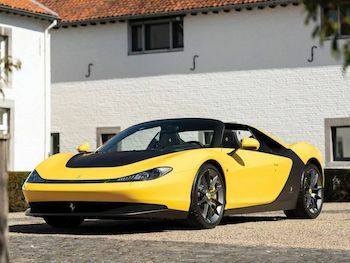 Rather than produce just one car through the Special Projects program, Pininfarina and Ferrari announced their intention to produce a half-dozen road-worthy Sergios for six lucky clients. 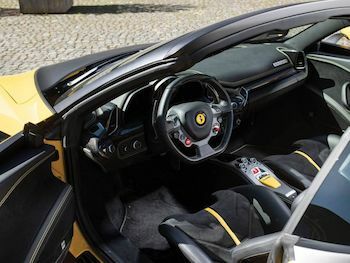 Still underpinned by the 458 Spider, albeit with a 458 Speciale engine, the road-going Sergio differed only slightly from its road-going concept in an effort to ease registration and homologation for road use, and still kept the original concept’s flair. Whilst the bodywork looked like nothing else from Ferrari’s line at the time, the windshield, interior and taillights were lifted straight from the donor car. Conventional doors (allowing for power-operated windows) and a slightly revised rear end also differed from the original concept. The particular example offered here holds a special place in the model’s history, as it was the first road-going model unveiled to the public at the 2015 Geneva Motor Show on Pininfarina’s stand. Afterwards, it was delivered new to its first owner in Switzerland and since then, the car has accumulated less than 200 km from new. As such, it is presented in virtually as-new condition, just as if it left the stand at Geneva yesterday. The Sergio celebrates not only Sergio Pininfarina’s life, but also the collaboration between both his company and Ferrari, honouring their collective past but looking to the bright future ahead. Of the six Sergios, it could be argued that this, the 2015 Geneva Motor Show car, is the most important. Therefore, it would be a perfect addition to the world’s foremost Ferrari collections and would sit proudly alongside its coachbuilt ancestors. RM Sotheby's have estimated this unusual supercar is set to fetch between 2,500,000 and 3,000,000 euros when it goes under the hammer on Saturday in Monaco as one of the jewels of its prestigious sale.